He can stop running backs. Stopping prejudice? That’s something different altogether. Azeez Al-Shaair is a senior linebacker at Florida Atlantic University, and he knows a certain segment of the population stopped processing anything about him about the time they came to the hyphen in his name. “Everybody knows I am Muslim just from my name,” he said. But just because everybody knows that about Al-Shaair doesn’t mean they actually know Al-Shaair. Or what it means to be a Muslim football player in this climate — political climate as well as atmospheric. To say the Owls have accepted Al-Shaair as one of their own doesn’t begin to tell the story. He’s the type of leader who, when he opens his mouth, others shut theirs. He’s only 21, but with maturity and wisdom beyond those years from a lifetime of hardship that includes seeing his family’s home burn to the ground. Shortly thereafter, he turned to football as a way to take out his frustrations. “It was kind of the one time where I felt like I was good at something, or was worth something,” he said. NFL scouts have an idea of what Al-Shaair, a 6-foot-2, 228-pound senior, is worth, and it’s much more than he once thought. It’s why he nearly didn’t return for his senior season, which begins Saturday at Oklahoma. “You understand the type of person I am, and I’m a good person,” he said. 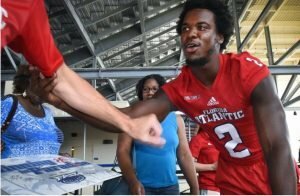 FAU defensive coordinator Tony Pecoraro believes Al-Shaair is a good person. And a resilient one, because being a Muslim football player in Florida means undergoing an extreme test of faith. Ramadan, the ninth month of the Islamic calendar, requires fasting from dawn to sunset, and it encompasses parts of May and June. That means not even a sip of water. During practice. Al-Shaair said he’s not even tempted to take an occasional sip. “My religion and my faith really has made me who I am,” he said. So, no — no sips on the sly, even when the heat index hits triple digits. What all the other Owls do, Al-Shaair does. There’s no dialing back to make concessions for his situation. As soon as the sun goes down, he shifts into an entirely different mode. Al-Shaair can speak for hours about the chaos he has experienced. The house fire, before his sophomore year of high school, started after an older sister accidentally left the stove on. A smoke alarm awakened him, then he woke up everyone else in the house to get them to safety. The house, however, could not be saved. The family was insured, which got them into a motel. About 10 relatives were crammed in for nearly a year, with a bed and a pull-out couch. Azeez slept on the floor. The motel was a two-hour bus ride from Hillsborough High. That’s not the only reason he received the Rudolph Award. His family lived in Saudi Arabia for two years starting when he was 4. After returning to the States, his parents soon divorced, leaving Azeez, his mother and siblings in Section 8 housing. Last season, he suffered an elbow injury requiring Tommy John surgery. He opted to postpone surgery until after the season, but still made double-digit tackles in every game except a blowout in which FAU’s starters were pulled. He made 117 tackles during the Owls’ 10-game winning streak and is their all-time leading tackler. If finding his niche in football qualifies as a blessing, so too is his relationship with girlfriend Yahaira, whom he became engaged to early this year. More reason to think his luck is changing. When the opportunity to play college football came his way, Al-Shaair chose to major in public safety administration. The idea was to give back by becoming a firefighter. Pro football might have something to say about that. 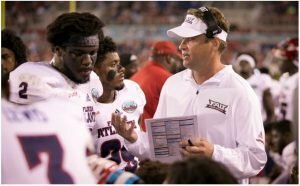 He sat down with FAU coaches including Lane Kiffin after last season but chose to return. This preseason, Sports Illustrated rated him the 79th-best player in the country. If and when that NFL contract comes his way?